Frank Nastasi was born in Detroit, Michigan on January 7, 1923. As a youngster he attended Santa Maria Catholic School. “The nuns were our teachers,” recalled Nastasi. “They saw that I could memorize real fast, so they would give me a lot of extra things to do. They said, “Frank, you’ve got to memorize these three pages.” And I carried on from there.” By the time Nastasi was a senior at Detroit’s Northern High School he was performing stand-up comedy at nightclubs in and around Detroit. Nastasi attended Wayne University, where he earned a bachelor’s degree. In the early 1950s WXYZ-TV’s programming director Pete Strand hired Nastasi for a new children’s show, Tommy Twinkle. Nastasi played Mr. Purdy, bookkeeper to Mother Goose. 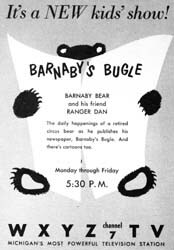 Nastasi’s next show was Barnaby Bear, the saga of a retired Circus bear turned newspaper publisher. The program was very popular, but was cancelled after six months because the sponsor, Sara Lee bakery, couldn’t bake enough cakes and pies to meet the demand the show created. When Wixie’s Wonderland ended it’s run Nastasi moved to New York City, where he earned a master’s degree in dramatic arts from New York University and appeared in a handful of Broadway and off-Broadway productions. 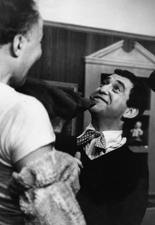 In 1964 he caught up with his old buddy Soupy Sales and became a full-time puppeteer for The Soupy Sales Show. Nastasi also made a comedy record with Sales and appeared with him in the movie Birds Do It. Nastasi died after a short illness on June 15, 2004. As a young boy he originally wanted to be a pro ballplayer. “They wanted to send me to the minor leagues. I could play better than most of the salamis on the field, but the scouts wouldn’t look at me because I was only 5’5”.” Nastasi may have been short in stature, but he was tall enough to portray a manic 6 foot tall cream pie wielding dog, tall enough to be seen in the third balcony in the largest Broadway theatre and tall enough to win the hearts of millions of television viewers through his work on The Soupy Sales Show.